Christmas Time! 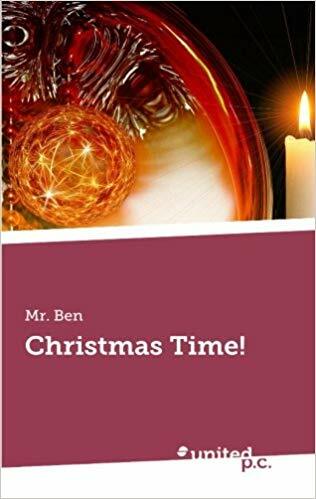 is a collection of short stories that reflects the mood of the season-Christmas-as it affects the lives of people who have its worth appreciated. From children to young adults, it mirrors, in the form of stories, the ordeals people go through to observe the yuletide but the encouragement they get, the courage they summon, the inspiration and the motivation they receive leave footprints of happy endings-celebrating the season in delight. “A Christmas to Remember” tells a story of a certain couple, Frances and Sean, whose over-the-years Christmas celebration routine was cut short by the inability of Ron, Sean long-time friend , to pay back his debt as at the time stipulated. His whereabouts weren’t known and this subsequently brought hopelessness to Sean (though he had some ‘belief’ that something would happen) until the eleventh hour miracle…barely two hours before Christmas-the 25th day of December. His twin daughters witnessed it! Chapter Three’s “I Love Christmas” portrays the boy-in-a-man figure in Mr. Ted whose ‘boy-child’ manner was inspired by the statement his five-year-old son, Grant, made, ‘I Love Christmas’. The way Mr. Ted and his wife celebrated Christmas as their son had fun with his peers, was a scene to behold! “Your Christmas View” is a play depicting how the long-held ‘tradition’ (yearly hosting of the event-twenty four hours before Christmas and whose venues were held at their various apartments) of meeting of Yates and friends not only ensured the proper view of Christmas to readers or listeners but enabled he and his wife, Michelle, to be in the ‘business’ of putting to proper perspective the view of Christmas in the life of their twelve –year-old daughter, Jasmine using what we recorded the last time the event was hosted- ‘Your Christmas View Hosted by Yates’. The feel of sensuality in the stories harmonizing with their “messaging” undertones, and the unveiling of the article: “Christmas: Recognizing its true worth” birth…Christmas Time! Sean and Frances have been happily married and living in Oakland for close to twelve years. Their union produced a set of two lovely female twins-Tania and Juliana. A successful contemporary entrepreneur for years, Sean has always ensured that needs of the family are met. Frances, on the other hand, is a compliment of her husband. A caring housewife and an excellent store keeper, the total well-being of every member of the house has never fall off her shoulders, since her marriage to Sean and she has been a great asset to her manager for the past five years. Tania, Sean’s look-alike, is the very jovial, yet down-to-earth type while Juliana, Frances’ carbon copy, is rather reserved and would always chose to be alone, though related with her sister and parents. Though both liberal in general, Sean and his wife have painstakingly nurtured their lovely twin daughters, since the age of three, to learn how to stay calm in the midst of life’s troubles and appreciate whatever that is given to them, regardless of size. This would come in handy in the future. As with Sean and Frances, Tania and Juliana have so grown up with this orientation and gotten used to tradition that Dec. 1 is when Christmas begins. Celebrating the festive season with the rest of the neighborhood at the Oakland City Square to see the Santa Claus, have fun, play with the ‘Mary-go-round’ facility at the Oakland Amusement Park was what Sean, Frances. Tania and Juliana were fond of doing. Visiting Santa Claus at the Park would start from Dec. 18 all through to Jan.3. Sean’s success attracted Ron, a friend and colleague of twenty years. He would always come to celebrate Christmas with Sean and his family. Through the years, “Ron” as Frances once observed, “has now become part of the family”. But a time came when he needed the assistance of Sean. Ron requested that Sean borrowed him a sum of $120,000 to execute a business plan in Young Island and promised to pay five months later with an interest rate amounting to 55%! He requested for this loan February 3 and assured his bosom friend updates every two weeks. On grounds of trust and after discussing it with Frances, Sean took the risk by lending the money to him. From the period that chronic turbulence began, Frances had been the one shouldering the entire responsibility of the family. She would be the one to pay for their daughters’ tuition fees, utility bills, other miscellaneous expenses, and even Sean’s daily up-keep. They both endured through life’s thick and thin, complemented with the understanding of Tania and Juliana. Though they had cause to exchange words at each other, the strength of love between them kept the home in one peace. “Dad, this is two days to Christmas…I haven’t seen any Christmas decoration in the house. We haven’t been seen Santa Claus! We haven’t heard fun like our friends and neighbors! Why?” Asked Tania, with a worry on her face. Sean was looking sobbed. His sudden mood change didn’t catch Tania’s attention as she charged towards the kitchen to assist her mom. But Juliana knew something wasn’t right. “Hmmm…Yes! ‘No matter the situation in life, always stay calm!’” Juliana answered in burst of enthusiasm. “Why so difficult?” She asked out of curiosity. Sean saw the ‘I-am-serious-to-know-what-happened’ look on her face but decided to tell her a tip of the iceberg. The atmosphere of life lifted the dying hopes of Tania and Frances. Juliana was strong in her belief that Christmas will be celebrated. After breakfast, they both left the house to the Oakland Playground, several miles away from the Oakland Amusement Park, to have fun with their peers-neighbors and friends-as they usually do, while Sean was with his wife in the house, appreciating the essence of their union. The Oakland Playground management ensured that none of the kids present returned home on an empty stomach by serving each and everyone of them lunch and ‘take-away’ foods-cookies, French fries and canned milk. It was late in the evening the duo of Tania and Juliana came home. It wasn’t long enough that they retired to bed. All through the night, Christmas songs filled the entire building as Sean took out time to search get tapes of recorded Christmas songs in his room with Frances. Surprisingly, Sean had no idea of how this year’s Christmas celebration would be: there was nothing that looked like a glimmer of hope of celebrating the season-Money yet to be recovered from Ron whose whereabouts were unknown and how ‘realistically’ untrue his assurances were to his twin daughters who wouldn’t want to discover the liar in their father. However, he kept his hopes alive. Sean wasn’t alone in this. Frances, all along shouldering the weight of responsibilities of the family, was on hand to always assure him of that which he was confident of –celebrating Christmas with the rest of the Oakland Neighbors. Sean was consoled. On the bed where the both laid, she cuddled him and was able to wipe away the tears he tried shedding. They both slept on each other’s arms to the early morning hours of 7: 30AM. Christmas songs permeated every part of the house. Christmas themes as Jingle Bell, We Wish A Merry Christmas, Joy To The World and Noel were heard. Unlike yesterday, everywhere was booming with life, though there was no single Christmas decoration. Tania and Juliana were done with breakfast and as usual, went off to play. Sean and Frances were in the house hoping, looking from all cardinals of the earth-north, south, east and west-for that miracle to make this year’s celebration a Christmas to remember. At about 9:58PM, when Tania and Juliana had long retired to bed and fell asleep, Sean and Frances were on the brink of losing out on hope when they heard a rather strange knock on their living room’s door, the entrance and exit points of the house. Meanwhile, the Christmas songs were being played; although very slowly because of the time. Sean switched off the audio player to confirm Frances’ claim. He heard the knock again. Frances went get the door as Sean sat on the Master Size Sofa looking on. To their bewilderment, it was Ron! They realized that he didn’t just come alone: he came in the company of other men, ready to decorate the house with the best of up-to-date interior and exterior Christmas decorations. Sean jumped out of his sitting position and hurriedly charged towards Ron, hugging him. The men positioned properly all the exterior decorations at the building’s front yard and took the interior decorations with them. Sean knew that all was settled. After they had been served each a glass of water, He didn’t waste much time to begin a discussion with Ron. Frances gladly took her seat at the dining room area to hear them discuss and observing all the decorations the men came with. Frances couldn’t help but to express her tear-joy mood and the rest of the men, seven of them in number nodded their heads in happiness, chuckling at different intervals. For the next two hours, decorations were in progress-the interior and exterior parts of the building. All manner of Christmas lights, candles, bunnies, Christmas trees, toy versions of the Horses’ Rides, Amusement Park and others were all put in place. Sean and Frances, together with Ron saw to completion the decoration process. “Merry Christmas” Ron said, shaking hands with Sean as Frances looks in awe at the building’s back yard. “All is finished! My men are done with the decoration… You, know Ron, we have to our leave. Frances went climbed the staircase to wake her twin daughters in their rooms. Seeing that Frances had gone into the house, Ron took out something from his all-round jacket pocket a sealed envelope. At this point, Sean was looking forward to what would in that envelope. Sean opened the envelope and saw in it a check of one million dollars! Sean couldn’t believe his eyes. “Let’s go together” She suggested. It wasn’t long Ron, Sean, Frances, Juliana and the seven men drove off and hit the Oakland City Bank. As the cash was withdrawn, Frances and his family had to part ways with Ron and his men. Three hours later, the Christmas celebration was heated up in the house like never before. No eyes went dim all through. It was fun all the way. Each and every member of the family couldn’t just wait for the breaking of the day…To catch the fun they thought they have for this year’s Christmas. Their building’s decorations were sights to behold: it was the most decorated in the whole Oakland! From Dec.25 through to Jan.3, the following year, Christmas celebration filled their mouths and touched all fibers of their being. They cuddled each other and kissed passionately.